The regular readers of this blog will remember me mentioning a competition being conducted by Worldlabel.com in conjunction with the OpenOffice.org documentation project for creating Open Source templates. Guess what..., On the eve of the New Year, they have released the winning template which is a Thesis template for OpenOffice.org Writer designed by Matthias Ansorg. This template won the first place for its overall detail, comprehensiveness, complexity and use of different elements and functions. Worldlabel is synonymous with creating labels in a variety of shapes and sizes for ones use which includes those for CD/DVDs, video, mailing, diskettes and shipping. And Worldlabel lets you download a set of free templates for designing and drawing labels in OpenOffice.org format and that too in both A4 and A5 paper sizes. In fact, the templates are available in XML Open Document Format (ODF) apart from Word and PDF and are released in the public domain, licensed under GPL. At this stage some of you might wonder why you need a template for creating a seemingly simple task as printing labels. In the past, I have spent a couple of hours doing mailings and I can vouch for the fact that at the least, in many cases, it has been a hit and miss affair with the printer printing the addresses outside the label borders. And at the end of all that time and effort spent, I was left holding a couple of label sheets which had the addresses printed in a skewed manner. The problem is that spacing for your label documents has to be extraordinarily precise to make sure that the text is printed exactly where it needs to be and if there is any difference in the spacing, then the text will overflow the labels when printed.This is where templates come into the picture. Using ready made templates such as the ones from Worldlabel which are provided free of cost and released under a Free license, it is possible to get the printing right each and every time thus minimizing the wastage of paper and ones efforts. Using Worldlabel templates in OpenOffice.org is easy. It involves first downloading the templates from their website and saving them in a folder in your machine. Worldlabel has made it possible to download individual templates in Open Document Format or all of them at a stretch as a compressed archive. In the latter case, you download it and unpack the archive in a directory of your choice. I decided to download all the templates at one stretch and so selected the archive. And I created a directory named "oOTemplates" in my Home directory ( /home/ravi ) and unpacked all the templates into it. The next step is to import the templates residing in the "oOTemplates" directory into OpenOffice.org so that they can be used to create the labels of the desired dimensions. There is a simple way of importing the templates into OpenOffice.org; which is to open OpenOffice.org and navigate to 'File -> Templates -> Organize' which will open the "Templates Management" dialog. 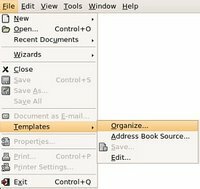 This dialog contain two panes namely the template pane and documents pane. Right clicking on any folder in the template pane and selecting 'New' will create a new folder for which you can give any name of your choice (See figure below). Since I was importing Worldlabel templates, I named the folder worldlabel. Now right clicking on the just created worldlabel folder in the template organizer and selecting 'Import' opened the file open dialog and I was able to import the Worldlabel templates which I had saved previously in the 'oOTemplates' directory. From here on, to use a template, all I need to do is select 'File -> New -> Templates and Documents' which will open the template dialog and I can select the template of my choice and start working in it. You will find a detailed article on using and customizing OpenOffice templates at the following link. With Linux and Open Source gaining momentum, more and more business houses are realizing the advantages of embracing open file formats for their documents. And Worldlabel through its efforts in releasing top quality label templates in the public domain and also by taking the initiative to promote a competition to create the best template for OpenOffice.org office suite is pulling all stops to see that there is enough public awareness about the advantages of using Open Source software in general and open file formats in particular. What about label templates for US Letter sizes instead of just A4 and A5 paper? I think there should be some sort of community forum area where anyone using openoffice could post all sorts of document templates. I know I have spent quite a bit of time in the past just tryting to find even a simple letter template. The label templates are both US Letter size and a4 size for Europe and Asia.